A while back I wrote a very popular page describing how to install a wide variety of chemiformatics packages on a Mac, since there have been some changes with Homebrew which have meant that a few of the scientific applications are no longer available so I've decided to rewrite the page on installing the missing packages using Anaconda. I've also included a list of quick demos so you can everything is working as expected. In addition to gfortran and a selection of developers tools. The details of some of the projects taking part in the Google Summer of Code are now online here https://summerofcode.withgoogle.com/organizations/6513013473935360/ under the Open Chemistry header. Really interesting work includes 3-D coordinate generation, standardising fingerprint APIs, a framework for molecular validation, and standardization and molecular dynamics in Avogadro. Good luck to all that are taking part!! There are a number of interesting projects being undertaken in this years Google Summer of Code. If you know of any students that might be interested then perhaps point them to the Open Chemistry Project. The Open Chemistry project is a collection of open source, cross platform libraries and applications for the exploration, analysis and generation of chemical data. The organization is an umbrella of leading projects developed by long-time collaborators and innovators in open chemistry such as the Avogadro, Open Babel, and cclib projects. These three alone have been downloaded over 700,000 times and cited in over 2,000 academic papers. Our goal is to improve the state of the art, and facilitate the open exchange of chemical data and ideas while utilizing the best technologies from quantum chemistry codes, molecular dynamics, informatics, analytics, and visualization. There is a list of the GSoC Ideas 2018 here but of course students can add their own. The web based application is available as an Open Source software that offers modern solutions for chemical researchers. The Chemotion ELN is equipped with the basic functionalities necessary for the acquisition and processing of chemical data, in particular the work with molecular structures and calculations based on molecular properties. The ELN supports planning, description, storage, and management for the routine work of organic chemists. It also provides tools for communicating and sharing the recorded research data among colleagues. Meeting the requirements of a state of the art research infrastructure, the ELN allows the search for molecules and reactions not only within the user’s data but also in conventional external sources as provided by SciFinder and PubChem. Developed/tested on Linux and Mac, deployed on Linux. 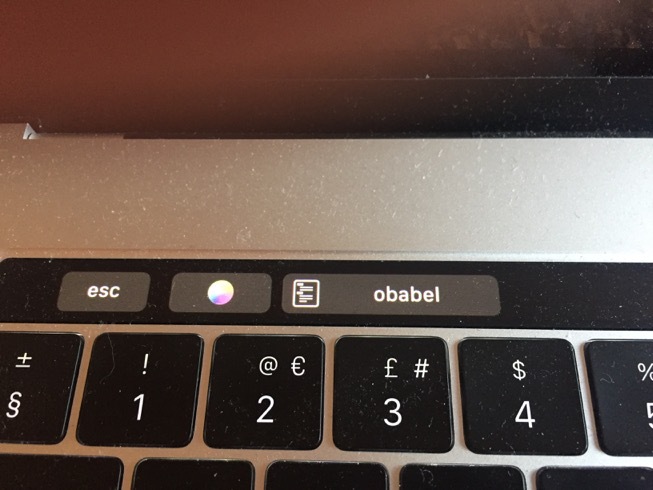 the Touchbar illuminates as shown below, if you then touch "obabel" it opens the manual page for you in another window. Seems to work for other command line tools also. I just noticed that the latest version of iBabel has been downloaded over 1000 times, this is fantastic news and it certainly allows me to justify the effort put into creating the application. 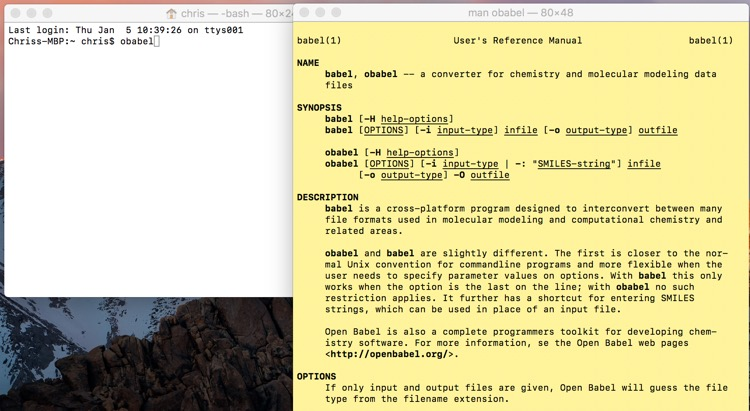 I’m occasionally asked about the best way to install OpenBabel and I usually refer people to the page I wrote on installing cheminformatics tools on a Mac, this gives instructions on how to install a wide variety of cheminformatics toolkits and applications. If you only want to install Openbabel then the best way is to use Homebrew. Start Xcode on the Mac. Choose Preferences from the Xcode menu. In the General panel, click Downloads. On the Downloads window, choose the Components tab. Click the Install button next to Command Line Tools. You are asked for your Apple Developer login during the install process. Or You can download the Xcode command line tools directly from the developer portal as a .dmg file. https://developer.apple.com/downloads/index.action. On the "Downloads for Apple Developers" list, select the Command Line Tools entry that you want. The 'brew doctor' command checks everything is fine. e.g. it will warn if the developer tools are missing, and if there are unexpected items in /usr/local/bin and /usr/local/lib that may clash and might need to be deleted. A major new update to OpenBabel has been released, version 2.4.0 is a significant change and is highly recommended. I just noticed that the latest version of iBabel has now been downloaded over 700 times since it was released at the start of the year. iBabel started out as an AppleScript Studio application designed as a front-end to OpenBabel DOI, this was updated several times and is now an ApplescriptObjC application built with Xcode. 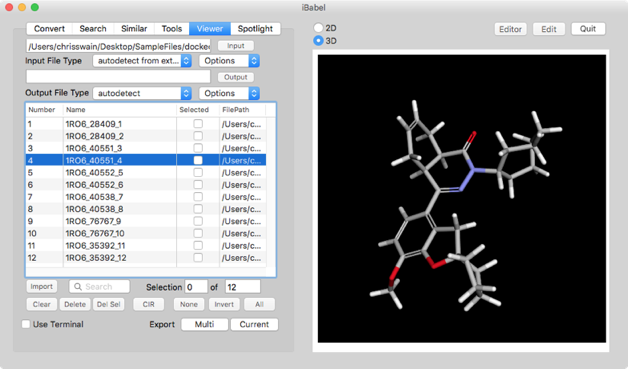 As well as acting as a front-end to OpenBabel it also provided a front-end to tools built on OpenBabel and a molecule viewer. I thought I'd have a look at the number of downloads of iBabel there have been since I announced the latest release last month. So far there have been over 250 downloads and there seems to be a steady stream of downloads as shown in the plot below. A couple of readers have asked if they need to install OpenBabel in order to use iBabel. The answer is YES, iBabel is a graphical user interface that means you don't have to remember all the command line instructions in order to use OpenBabel. iBabel started out as an AppleScript Studio application designed as a front-end to OpenBabel DOI, this was updated several times and is now an ApplescriptObjC application built with Xcode. As well as acting as a front-end to OpenBabel it also provided a front-end to tools built on OpenBabel and a molecule viewer using a selection of java applets and plugins via an embedded web view. Now things have settled down a bit I've restarted work on iBabel and an update is now available. I've transitioned most of the calls to babel over to obabel the differences are highlighted here and replaced the calls to the tools based built on OpenBabel with the new corresponding calls to obabel. Whilst it is possible to convert a ChemDraw file to an image the problem is you get a single png file containing all the structures. In order to get individual image files it is first necessary to separate the individual structures. The easiest way to this is to convert from cdx to SMILES format. We can then take each of the individual SMILES strings and generate an image using OpenBabel all controlled by an Applescript. After I posted the page on setting up a Mac for Cheminformatics I was asked if I could do something similar for writing chemistry (or Science in general) Python scripts on a Mac. So I’ve written a “How to” page on setting up your Mac to use the iPython notebook and write simple scripts that use Pybel to access OpenBabel. The page is here Python, Chemistry and a Mac 1, and I’ll probably add more pages/scripts in the future. ChemmineOB provides an R interface to a subset of cheminformatics functionalities implemented by the OpelBabel C++ project. 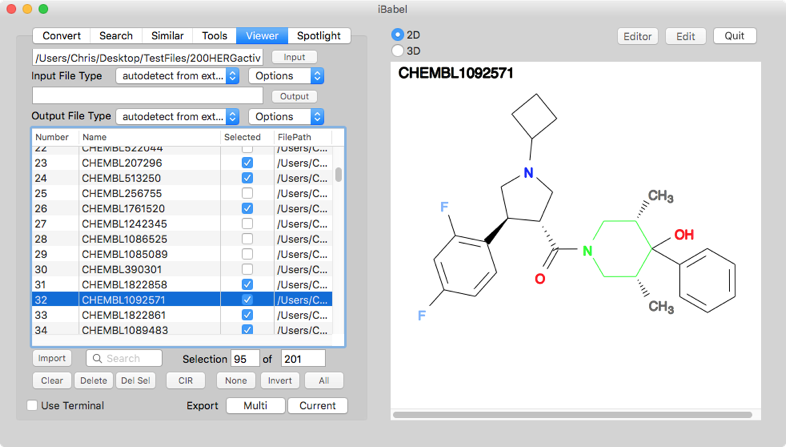 OpenBabel is an open source cheminformatics toolbox that includes utilities for structure format interconversions, descriptor calculations, compound similarity searching and more. ChemineOB aims to make a subset of these utilities available from within R. For non-developers, ChemineOB is primarily intended to be used from ChemmineR as an add-on package rather than used directly. I just saw this publication and I thought it might be of general interest. The number and diversity of wrappers for chemoinformatic toolkits suggests the diverse needs of the chemoinformatic community. While existing chemoinformatics libraries provide a broad range of utilities, many chemoinformaticians find compiled language libraries intimidating, time-consuming, arcane, and verbose. Although high-level language wrappers have been implemented, more can be done to leverage the intuitiveness of object-orientation, the paradigms of high-level languages, and the extensibility of languages such as Ruby. We introduce Rubabel, an intuitive, object-oriented suite of functionality that substantially increases the accessibily of the tools in the Open Babel chemoinformatics library.